Momoko 120% © 1986 Jaleco. 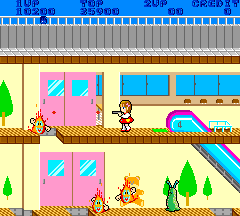 A girl must shoot monsters and escape from a burning building. The game starts at preschool and ends at a wedding chapel where she is to collect items and get married, only for the game to begin again. 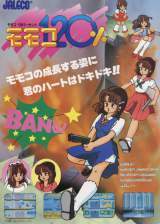 Momoko 120% was released in August 1986. This game was originally slaked to be an Urusei Yatsura game, but for some reason Jaleco was only able to use the license on the Famicom port. Despite this, they still used the opening theme as the main background music.